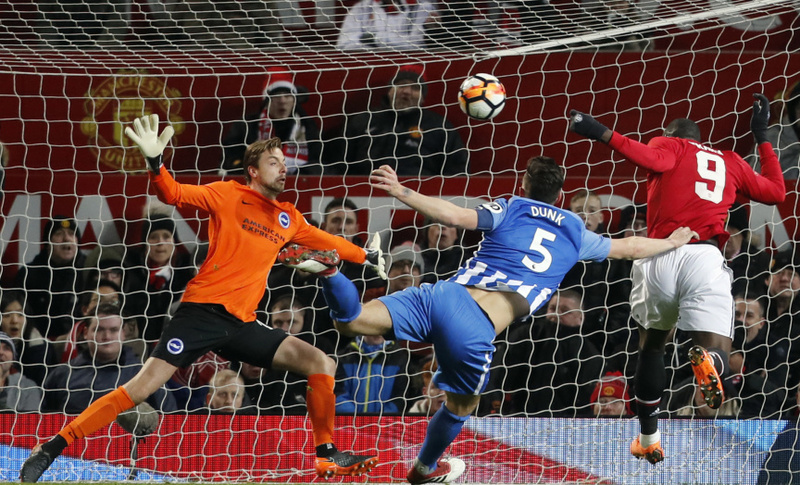 MANCHESTER, England (AP) — Romelu Lukaku and Nemanja Matic scored in each half as Manchester United reached the semifinals of the FA Cup with a 2-0 victory over Brighton on Saturday. Lukaku picked up Matic's precision pass from outside the box to nod the opener in the 37th minute. Matic doubled United's lead in the 83rd by heading in from Ashley Young's free kick. Alexis Sanchez started on the bench for the first time since his January arrival, with Paul Pogba another among the substitutes. Neither player made an appearance in the quarterfinal as United made a swift recovery from being knocked out of the Champions League by Sevilla in midweek. Tottenham joined United in the FA Cup semifinals by beating Swansea 3-0 earlier Saturday. In the other quarterfinal matches on Sunday, Chelsea visits Leicester and third-tier Wigan is at home to Southampton.